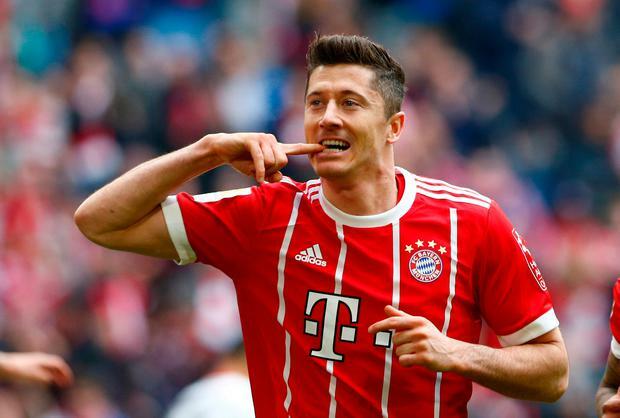 Bayern Munich striker Robert Lewandowski is believed to have set his heart on a move to Real Madrid this summer and that could have a big impact on Manchester United's efforts to sign Gareth Bale. United have tried and failed to sign Bale on several occasions in recent years, but a deal to bring the Welshman to Old Trafford is finally possible after he hinted he is ready to leave Spain following a match winning display in last Saturday’s Champions League final against Liverpool. Bale confirmed he would discuss his future at Real Madrid in the coming days, with his spectacular goal in Kiev last weekend cementing his belief that he should be playing regular football every week. That has not been the scenario for Bale in recent months, with Real Madrid coach Zinedine Zidane leaving his star man on the bench for key games, including the season-defining clash against Liverpool. Bale's public claims that he is pondering his future at Real Madrid may well have hastened his exit from the club, with Bernabeu chiefs already planning to shake-up a squad that finished a distant third behind champions Barcelona in the Spanish title race. Gareth Bale's wonder goal was the highlight of the Champions League final. Real Madrid will allow key players to leave to make way for new star names to arrive, with Bale among those likely to be moved on if an expensive bid to sign Lewandowski is launched. The Poland hit-man has been a long-term target of Real Madrid chief Florentino Perez and now there are suggestions that he has ordered his agent Pini Zahavi to try and set-up a dream move to the Bernabeu. "Robert feels as if he needs a change and a new challenge in his career and Bayern's bosses have been informed," Zahavi told Sport Bild. Lewandowski has made little secret of his desire to win the Champions League and to play for Real Madrid at some stage in his career and he appears to be keen to push for both of those ambitions in this transfer window. Meanwhile, reports in the UK media suggest United are reluctant to spend the bulk of their summer transfer kitty in a bid to sign Bale, but it is clear that the Old Trafford club are keen to make a fresh bid to sign the Welshman in the coming weeks. Tottenham have a buy-back option on Bale after their sold their star man to Real Madrid in 2013, but The Herald have been informed by sources close to Spurs that they will not be pursuing a move to re-sign the 28-year-old.